Mohaymen Stirs Hype in Holy Bull at Gulfstream: Racing’s newest star, Mohaymen, makes his 2016 debut in the $350,000 Holy Bull Stakes (GII) at Gulfstream Park on Saturday. After studying the past performances and watching videos, it appears nothing will stop him. 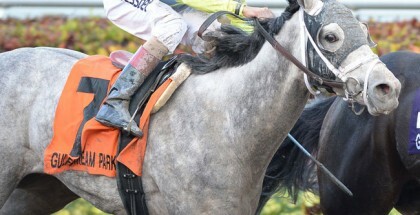 Kiaran McLaughlin conditions the son of Tapit and Justwhistledixie for Shadwell Stable. He won his first three starts, including two graded stakes races over decent competition. Will the Holy Bull turn into a romp? While the above call seems like a joke, why not? 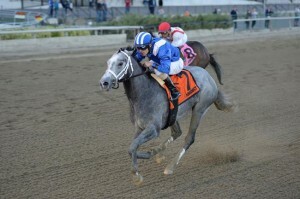 Mohaymen won his first stakes race in early November, the Nashua Stakes (GII) at Aqueduct. He defeated Flexibility and Sail Ahoy, earning a 110 TimeformUS Speed Figure in the process. To compare, Breeders’ Cup Juvenile (GI) champion Nyquist scored a 104. In the Remsen (GII) the same month, Mohaymen finished ahead of Flexibility again and the talented GIft Box. He earned a 115 TimeformUS Speed Figure, which means he ran 11 points faster than Nyquist’s Breeders’ Cup victory. Flexibility returned to win the Jerome Stakes (GII) easily, showcasing the quality of Mohaymen’s win. Plus, the September maiden win came over King Kranz, runner-up in the Futurity (GII) at Belmont Park. McLaughlin spoke to Thoroughbred Racing Commentary’s Karen M. Johnson about Mohaymen. “With everything combined, it’s a huge edge for a trainer going forward to have a well-bred horse, who has won going a mile and an eighth in November as a 2-year-old, and who doesn’t get tired. He has it all,” McLaughlin said. The rest of the field ranges from uninspiring to sloppy-track specialists. 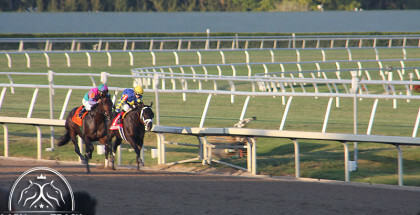 From the rail, Perfect Saint attempts to pull off the upset for trainer Dale Romans and the storied Calumet Farm. It is not clear why this horse is in the field though. He recently lost an optional claimer by 16 lengths and the Kentucky Jockey Club (GII) by 13 lengths. Is it possible Calumet Farm has Derby fever? In post position three, Fellowship takes a shot and it is puzzling why as well. He lost an ungraded stakes race by 16 lengths in his last start. Before that, he lost another ungraded race at Gulfstream Park West by two lengths. Conquest Big E might mount a challenge from the fourth slot. He won an optional claimer over a sloppy track at Churchill Downs. 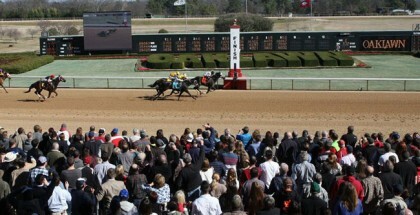 Runner-up Unexplained then ran an “unexplainable” fourth in an Oaklawn Park optional claimer. To be fair, Conquest Big E also won another sloppy-track race at the strong Keeneland meet. The second-place horse Deep in a Dream actually returned to win … a maiden claiming event, before losing his next two races. To the right, his sloppy-track specialist twin Greenpointcrusader attempts to capture his second win on fast dirt. At least, his first one came at the always strong Saratoga meet while breaking his maiden. Greenpointcrusader also won the Champagne (GI) in a powerful fashion, although the sloppy track helped him. He then regressed in the Breeders’ Cup Juvenile (GI) finishing seventh. Other handicappers are willing to excuse the performance. Frontier Ranger rounds out the field in the outside post. It will be quite the battle between him, Fellowship and Perfect Saint for fourth place, which still awards one Kentucky Derby qualifying point! The winner gets 10 points. On a somewhat unrelated note, a conversation on why horses with no chance enter the Derby came up on Facebook one time. Someone explained how owners love seeing their horse running with the Derby field, even if competitive for just a few moments. It means more to them than winning a smaller race. No other horse besides Mohaymen, Conquest Big E and Greenpointcrusader holds even a one-percent chance to capture the Holy Bull on Saturday, unless lightning strikes them all, but it is understandable why the connections of super longshots place their horse in a spot like this. They want to chase the ultimate dream and enter the Derby. Regardless, bettors who single Mohaymen will feel relieved when he crushes this field. Use Mohaymen with Conquest Big E and Greenpointcrusader in horizontals if necessary and key him on top in verticals. If a brigejumping situation occurs in the show pools, then consider betting a different horse to show.